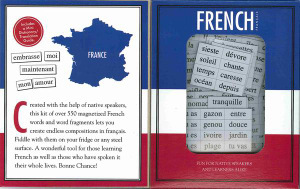 Magnetic poetry is a fun little tool you can use to learn and practice French. 500 magnets with words and parts of words help you to express yourself in a unique and creative way. IL – S – CHANTE – NT. In addition to writing poetry, you can use the magnets to practice sentence formation, word order, verb conjugations, and more. The set includes a mini dictionary to help you understand any words you don’t know. I like to display my poetic prowess on my side-by-side refrigerator. I have the individual magnets laid out more or less alphabetically on one door, making it easy to find the word I need and leaving the other door free for my poetic meanderings. You can also write poetry on any other metal surface, such as a desk, locker, or filing cabinet. While writing this, I discovered there are several magnetic poetry sets especially for kids. I haven’t tried them, but from their descriptions and photos, they look pretty good. Kids French Kit – Double-sided magnet flashcards with French on one side and English on the other. Magnetic French Words – Chunky double-sides magnet flashcards and a dry-wipe board and pen. Magnetic First French Words – Chunky wipe-clean French magnets.